This is a 4 hour AED training session focusing on how to use an Automated External Defibrillator (AED). AED training is a key part of the basic life support procedure when looking after a patient who has suffered a sudden cardiac arrest. This highly interactive and practical AED training course will provide you with the skills and confidence to know how to deal with a Sudden Cardiac Arrest specific to your workplace. Our defibrillator training will aim to incorporate familiarisation with the AED that you have in place. This course will be certified by Remote Emergency Care and is valid for 1 year. We can also supply AEDs (and other medical kits and equipment) via our partnership with our sister company Equip-Me. 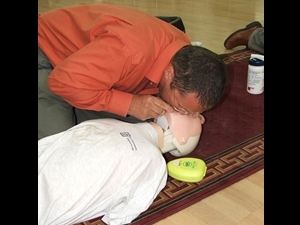 We also offer a joint package of AED equipment and training. Please contact us to find out more.